With the threat of the Hulk (see Marvel Mangaverse: Eternity Twilight) looming large, Tony Stark decides to unleash his greatest weapon. It’s a force so powerful that he’s even kept the secret from his Avengers, lest the villain, Apocalypse, would discover its existence. But, the Hulk’s destruction now outweighs the danger of Apocalypse, so Stark has given the location of the “Iron Avengers” to his team (Captain America, Hawkeye, Scarlet Witch, Vision). But, just as Tony feared, Apocalypse does learn of the weapons’ location, and he dispatches his team of villains to secure the “Iron Avengers” Mech Vehicles. However, the Avengers make short work of Apocalypse’s team (Sinister, White Queen, Juggernaut, and Archangel). They say that if you want something done right, then you should do it yourself, so Apocalypse, himself, takes on the Avengers. 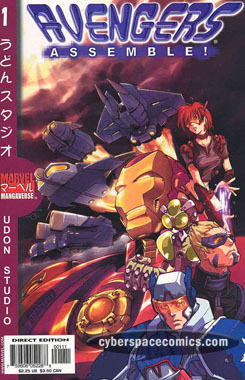 But, the Iron Avengers utilize their super-secret ability to combine into a giant mech-warrior (think Voltron) and they manage to defeat their arch-nemesis. Next up? The Hulk! This one-shot fits right between the Marvel Mangaverse bookend one-shots, and takes the phrase “Avengers Assemble!” to a whole new level. It’s a standard action-adventure romp with little room for character development but the upside is getting a look at all these newly redesigned characters. It’s fun to see them all through a manga-inspired lens. My biggest complaint is that putting super-heroes in mech-suits kind of defeats the purpose and fun of these heroes having super-powers.